Humble. Genuine. Kind. Gracious. Unassuming. Not the typical traits you’d associate with one of the NBA’s all-time greats, which is exactly what endears Warriors coach Steve Kerr to his community. It is also why I’ve chosen to share leadership lessons from Steve. No matter how you know him, you know Steve Kerr is a leader. Despite his tremendous success, Kerr is still the same humble, genuine, kind, gracious, and unassuming person he’s always been. Perhaps you remember Kerr from his days as a sharpshooting point guard for the Chicago Bulls and San Antonio Spurs. Or maybe you know him as the coach of the Golden State Warriors, who’ve won the NBA championship three out of the last four years. Perhaps to you Steve Kerr is a humanitarian, using his voice to champion equality. 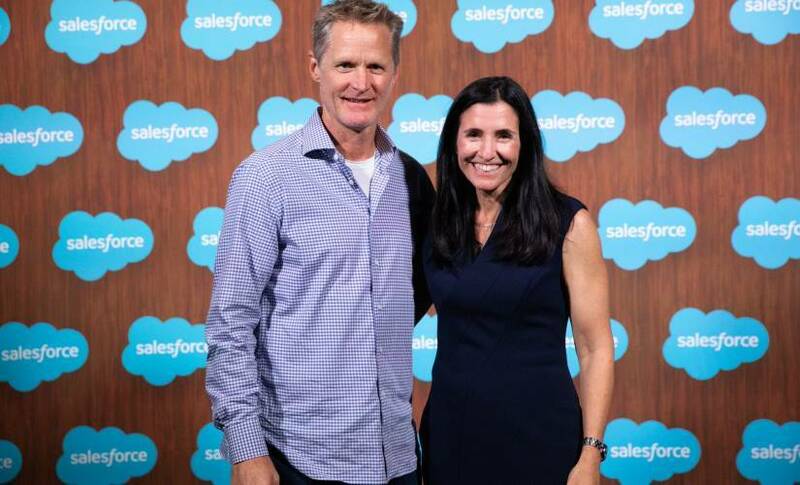 As part of his work with the Warriors Community Foundation, Coach Kerr recently served as a keynote speaker at Dreamforce, Salesforce’s annual conference. I found Kerr’s philosophies on leadership refreshingly unique. Whether you’re running a team or growing a small business, there is depth in Kerr’s thinking and viewpoints. Here are a few things I learned from his talk. Kerr chooses to lead from behind, always putting others in front of himself. Most noticeably, after each Warriors championship, Coach Kerr shies away from the spotlight, always refusing the microphone and trophy. When he does speak, he praises his players. In the workplace, leading from behind means putting your employees in front of yourself. It means shining a spotlight on their good work, and helping them to further their careers. In small businesses especially, teams must work together to stay afloat, retain their home-grown talent, and perform at their best. Kerr followed up his enviable NBA career with a lucrative second career as a color commentator, so the decision to move from television to coaching was not made lightly. He sought advice and took care to think about the kind of coach he wanted to be before making his choice. Kerr says that he had the “perfect apprenticeship” for coaching. He was able to play for legends including Phil Jackson, Gregg Popovich, Lenny Wilkens, and Lute Olson. Yet he was intentional in his preparation, developing a sound personal coaching philosophy of his own. Business leaders must be equally thoughtful with each decision. It’s just as important to work “on” your business as it is to work “in” your business. While it’s easy to get caught up in all of the details of making payroll, launching your product, and supporting customers, you need to put aside time to write a concrete business plan, think about your growth strategy, and be self-critical. Knowing your core values is a critical aspect of leading in an authentic way. As Kerr himself says, “No matter what field you’re in, you’re managing human beings.” That’s why communication and compassion are so important to him, and how he builds trust and rapport. As the Warriors coach he sometimes makes lineup decisions that seem confounding to outsiders (like starting Andre Iguodala in the 2015 finals), but they work — because people trust him and he communicates openly. Starting or running a small business involves similar leaps of faith. You’ve got to define your values; then let them guide you. In order to learn from your mistakes, you have to acknowledge them. Last season a frustrated Coach Kerr made a comment in a post-game interview that the team “didn’t care.” The words didn’t sit well with his players, who then vented their own frustrations, and their on-court performance suffered. Yelling and “tough love” is no longer viable in professional sports. By acknowledging mistakes, a small business leader can quickly learn from his or her failures and turn that into action, which is a distinct advantage over the larger competition. Despite his success, the unassuming Kerr remains deeply grounded and connected to his roots. Perhaps that’s why he started the Malcolm Kerr Family Scholarship Fund in honor of his late father. Coach Kerr’s scholarship doesn’t just give money to scholars in need; it also provides mentoring and other persistence services to keep them on the path to graduation. His dedication to the Warriors Foundation underscores his passion to help others in need and do what’s right. He gives for the right reasons and demonstrates true commitment to everything he undertakes. Small businesses can have the same impact by identifying a higher purpose that matters to them and using their companies as platforms for change. Whether it’s education, community service, or another need, be more than just a profit generator. Here’s hoping we all experience Kerr-like success — but may we similarly remember and acknowledge our roots. As SVP of Essentials and SMB Marketing at Salesforce, Marie Rosecrans empowers small and medium businesses with the resources they need to grow.